Seating is limited – Please call Sherry Zelichowski at (973) 263-1114 for more information on this event. 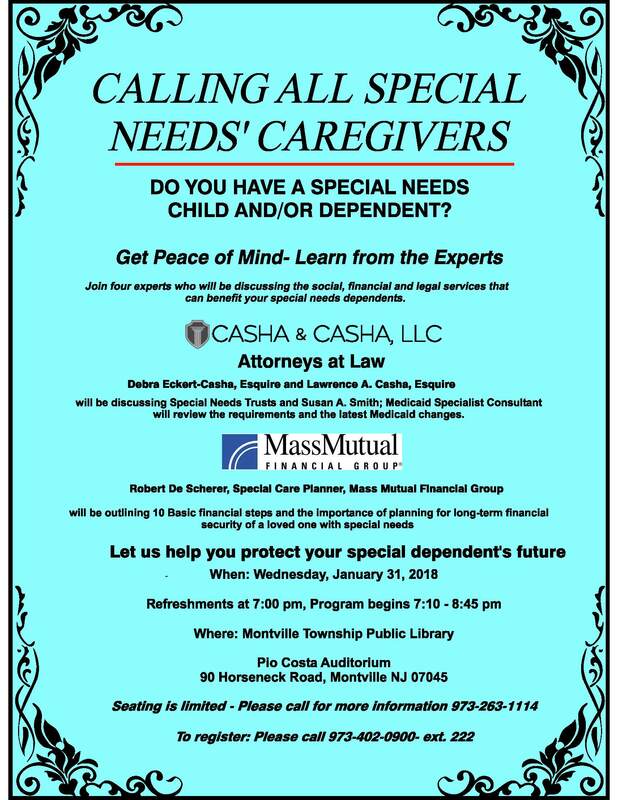 Casha & Casha, LLC is hosting a Free Special Needs Seminar “10 Basic Financial Steps for Special Needs Caregivers” at the Montville Library. This workshop addresses such critical issues as the implications of receiving governmental benefits (Social Security and Medicaid), creating a Special Needs Trust and relevant tax laws, the importance of a Will and considering a Letter of Intent. Debra Eckert-Casha, Esquire and Lawrence A. Casha, Esquire will be discussing Special Needs Trusts and Susan A. Smith, Medicaid Specialist Consultant will review the requirements and the latest Medicaid changes. Robert De Scherer, Special Care Planner, Mass Mutual Financial Group will be outlining 10 basic financial steps and the importance of planning for long-term financial security of a loved one with special needs.